There is a hole in the rock below the summit. The Nadelhorn forms part of the Nadelgrat ridge. This links the Lenzspitze, Nadelhorn, Stecknadelhorn, Hohbärghorn and Dirruhorn – all 4,000-metre peaks. These lie somewhat hidden, extending north-west from the Mischabel group, between Saas Fee and Randa. 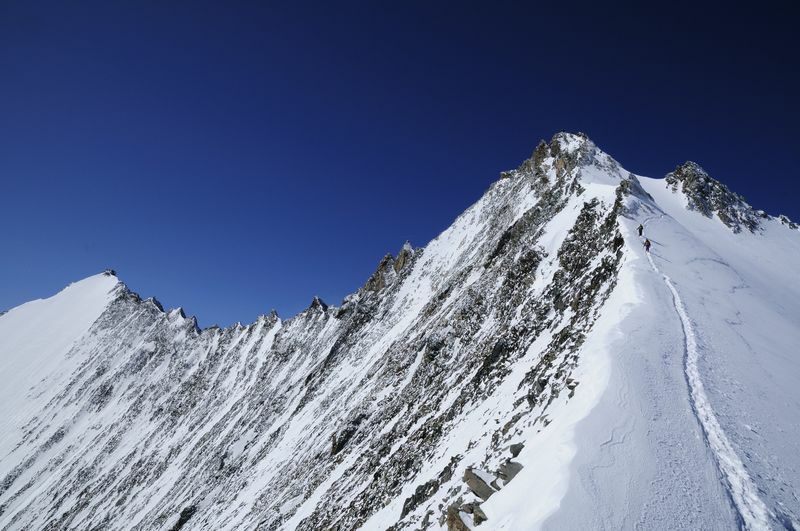 Their traverse is considered one of the finest ridge climbs in the Alps. There is a distinctive rock hole below the summit. The Nadelhorn can be scaled on skis in winter, from the Bordier hut via the Windjoch col. The Nadelhorn is the summit that most clearly deserves the name “Nadel” (“needle”), when seen from the north. However, the name originates from an oval hole, the “Nadelloch”, clearly visible from the Festijoch col on the ascent to the Dom. The hole is located about 10 metres north-west of the summit. On certain days of the year, the sun shines through the rock hole. 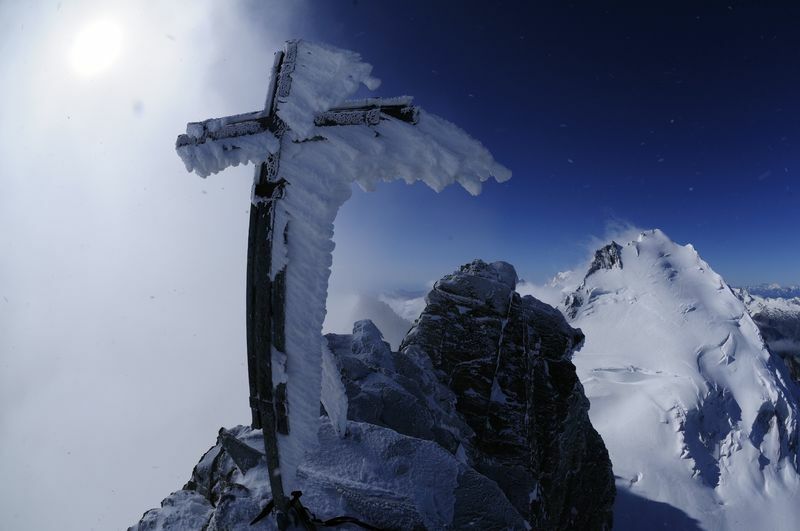 The people of Savoie called Mont Blanc the “Mont Maudit” – the cursed mountain. Is it any surprise, then, that the early inhabitants of the Saas valley likened the peaks of the Mischabel massif to a pitchfork (“Mistgabel”)? The names of the Nadelhorn and Nadelgrat do not refer to the point of a needle but to a cleft near the summit that suggests the eye of a needle. But what is the connection between a pitchfork and the eye of a needle? 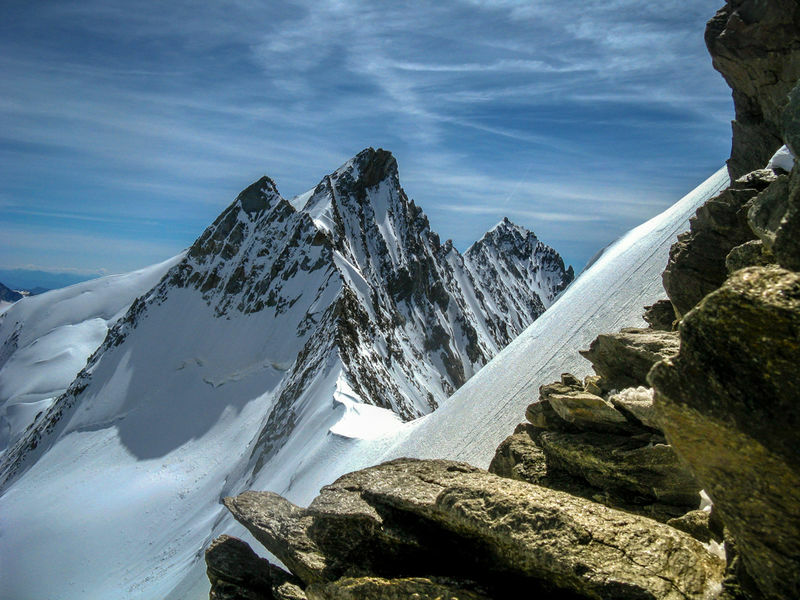 The first people to scale the Nadelhorn actually came to set up a trigonometric measurement point; climbing further, they found themselves unexpectedly on the summit. The first ascent followed an expedition to set up a trigonometric measurement point. The snow-covered northern flanks of the Nadelhorn form the top of the Ried Glacier; the Hohbalm Glacier extends to the east.